C-9833 Self-Sufficiency: A Complete Guide To: Baking, Carpentry, Crafts, Organic Gardening, Preserving Your Harvest, Raising Animals, and More! The inspiring guide to back to basics living, now fully updated! Now, more than ever, people across the country are turning toward simpler, greener, and quieter ways of living—whether they’re urbanites or country folk. Following in the footsteps of Back to Basics and Homesteading, this large, fully-illustrated book provides the entire family with the information they need to make the shift toward self-sufficient living. 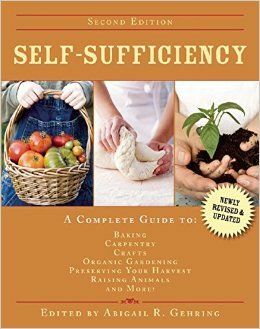 Self-Sufficiency provides tips, advice, and detailed instructions on how to improve everyday life from an environmentally and organic perspective while keeping the focus on the family. Readers will learn how to plant a family garden and harvest the produce; can fruits and vegetables; bake bread and cookies; design interactive and engaging “green” projects; harness natural wind and solar energy to cook food and warm their homes; boil sap to make maple syrup; and build treehouses, furniture, and more. Also included are natural crafts readers can do with their kids, such as scrapbooking, making potato prints, dipping candles, and constructing seasonal decorations. Whether the goal is to live entirely off the grid or just to shrink their carbon footprints, families will find this book a thorough resource and a great inspiration.